High-profile projects, such as Project Mercury, typically get a great deal of attention from Presidential Administrations. This presidential visit occurred on September 11, 1962, a month before the fifth Mercury flight. 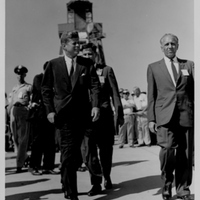 President John F. Kennedy (1917-1963) toured Cape Canaveral Air Force Station Launch Complex 14 (LC-14) the day before he travelled to Houston, Texas, and addressed an audience at Rice University to proclaim that "we choose to go to the Moon in this decade and do the other things, not because they are easy, but because they are hard," thus beginning the American space program's effort to put humans on the Moon. Original black and white photographic print, September 11, 1962: Private Collection of Dr. Calvin D. Fowler. Digital reproduction of original black and white photographic print, September 11, 1962. "John F. Kennedy Moon Speech - Rice Stadium." Software, Robotics, and Simulation Division, Lyndon B. Johnson Space Center, National Aeronautics and Space Administration. http://er.jsc.nasa.gov/seh/ricetalk.htm. Project Mercury Overview." John F. Kennedy Space Center, National Aeronautics and Space Administration. http://www-pao.ksc.nasa.gov/history/mercury/mercury-overview.htm. 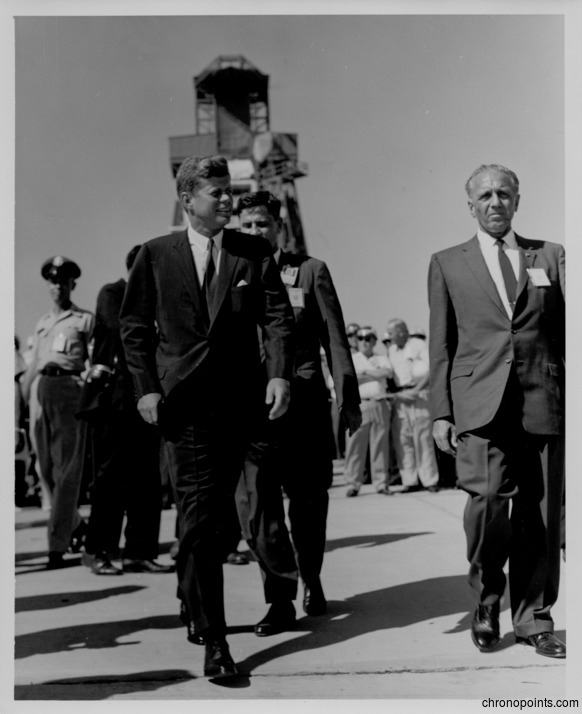 “President John F. Kennedy Touring Cape Canaveral Air Force Station Launch Complex 14.” RICHES of Central Florida accessed April 24, 2019, https://richesmi.cah.ucf.edu/omeka/items/show/4961.